M-1 Challenge 83 will be streamed live from Kazan in high definition onwww.M1Global.TV. Viewers will be able to watch the preliminary fights and main card by logging on to register at www.M1Global.TV. Fans may watch all the action on their computers, as well as on Android and Apple smart phones and tablets. World-class light heavyweight contenders Mikhail Ragozin (8-2-0, M-1: 3-0-0), representing New Stream Team, Storm School and Club Boets, and Brandon "Bull" Halsey (9-3-0, M-1: 0-1-0) are matched against each other in the main event, while Aleksander Doskalchuk (7-1-0, M-1: 1-0-0) takes on Vadim "Bad Santa" Malygin (11-2-1, M-1: 2-1-1). Last May in his most recent action, 25-year-old Ragozin (pictured below) stopped Alan Bispo,of Brazil, in the third round at M-1 Challenge 78. The Russian fighter hadn't fought in M-1 Global competition since 2015. Halsey, 30, is from Huntington Beach, California. A wrestler from the California State University in Bakersfield, Halsey captured the Bellator middleweight title three years ago by way of an opening-round submission (choke) of RussianMMA star Alexander Shlemenko, who avenged that loss with a knockout of Halsey in the first round this past June at M-1 Challenge 79. Halsey had difficulty dropping weight for his rematch with Shlemnenko and he immediately decided to move up in weight to light heavyweight. 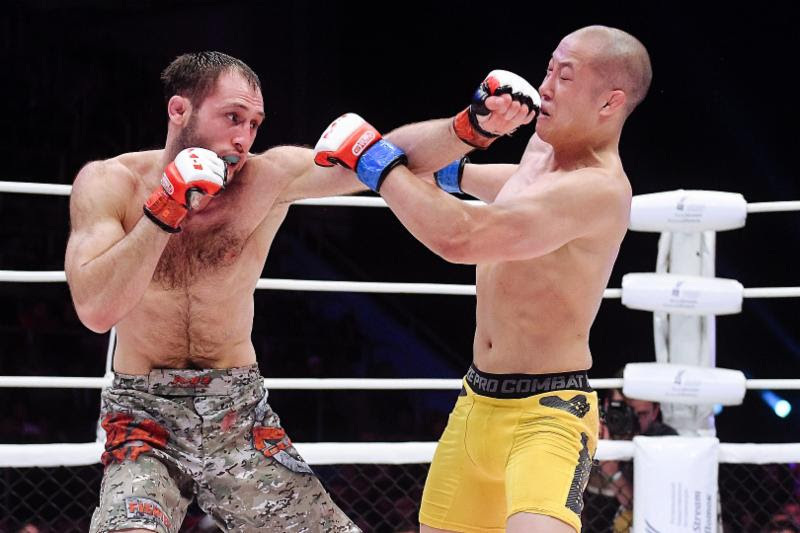 Ukraine-born Doskalchuk (pictured below on left) rides a four-fight win streak, including a three-round unanimous decision last May at M-1 Challenge 78 overSon Le Binh. The winner of his last three fights, Malygin (pictured below on right) is a Russian flyweight on a three-fight win streak, including a win by three-round unanimous decision over Fabricio "Bill" Sarraff at M-1 Challenge 78. 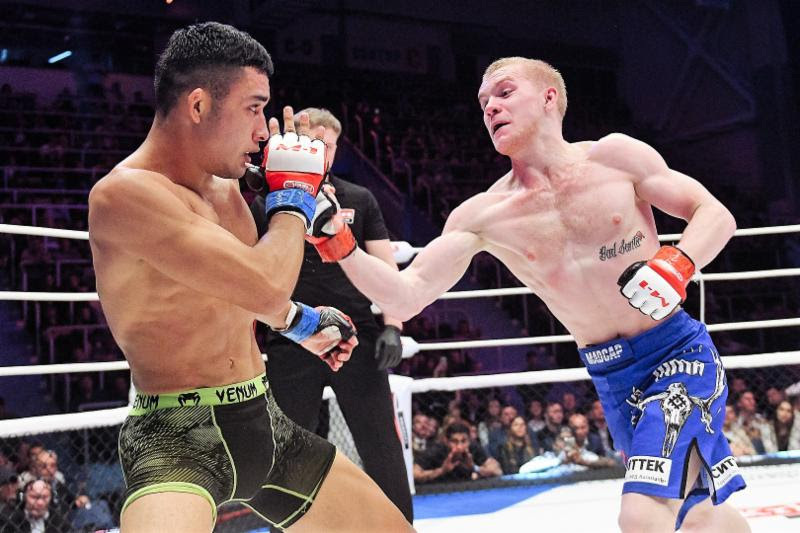 Also scheduled to fight on the M-1 Challenge 83 card is undefeated Russian lightweight prospect Vladimir Kanunnikov (8-0-0), who will be making his M-1 Global debut against Georgian Raul Tutalrauli (17-3-0, M-1: 5-1-0). American featherweight Nate "The Train" Landwehr (8-2-0) will also be making his M-1 Global debut versus veteran Russian fighter Mikhail Korobkov (13-2-1, M-1: 1-2-1), while Brazilian lightweight Diego (D'Avila) Davella (18-6-0, M-1: 1-1-0) takes on former Interim M-1 Challenge lightweight title challenger Alexey Nevzorov (12-3-0, M-1: 6-2-0), of Russia. The M-1 Challenge 83 preliminary card will showcase local pro fighters such as Ruslan Khisamutdinov, Kirill Kuzmen and Lenar Suleymanov. ABOUT M-1 GLOBAL: Founded in 1997, M-1 Global has established itself in Mixed Martial Arts (MMA) as the premier entity for discovering and developing the world's next-generation of superstar fighters. With its office in St Petersburg, Russia, the M-1 brand has staged more than 200 events worldwide, including M-1 Selection, M-1 Challenge, M-1 Global and M-1 Global HWGP events, in addition to co-promoting Strikeforce events and M-1 Global on the U.S. network, Showtime. Captivating live, television and broadband audiences with its superior production values and match-ups, M-1 Global events have featured some of the sport's top names, including legendary heavyweight Fedor Emelianenko, Andrei Arlovski, Gegard Mousasi, Alistair Overeem, Keith Jardine, Ben Rothwell, Melvin Manhoef, Sergei Kharitonov, Aleksander Emelianenko, Roman Zentsov, Yushin Okami, Mike Pyle, Denis Kang, Martin Kampmann, Amar Suloev, Chalid Arrab and Stephan Struve. 2017 has been another sensational year of world-class competition, featuring a full calendar of Challenge events, fueled by a talent-rich contention system ranking M-1 Global Champions among the greatest fighters in the sport. ABOUT M-1GLOBAL.TV: Enjoy MMA action now in high definition brought to you by M-1Global.tv, offering only the best fights from M-1 Global and otherMMA organizations. M-1Global.tv is a great platform developed specifically to bring together the most exhaustive fight video database. It also provides an easy and intuitive interface, helping everyone to start using the platform in no time while avoiding any spoilers. Besides watching the past fights on demand at any time convenient to the customer, viewers are able to enjoy the action LIVE, all available to M-1Global.tv users through a low-priced month to month digital subscription. Your world of action. Anytime!